Creation of a custom-made property booking system that lists over 120 properties Australia wide. Similar to a real estate listing, the system allows for quick search, high-resolution photographs, video, content marketing, SEO optimised headings, descriptions, text, tags, and categories. The system has full individual listings email capabilities and is all locked down with bank standard SSL-256bit encryption end to end. We originally designed their website back in 2010, back before mobile optimisation was a thing. We worked with IHP to survey their 20,000 customers and asked them what they wanted from their website. We then designed this current masterpiece over the course of 2 years, making incremental positive changes and rolling them out to customers smoothly and with outstanding results. 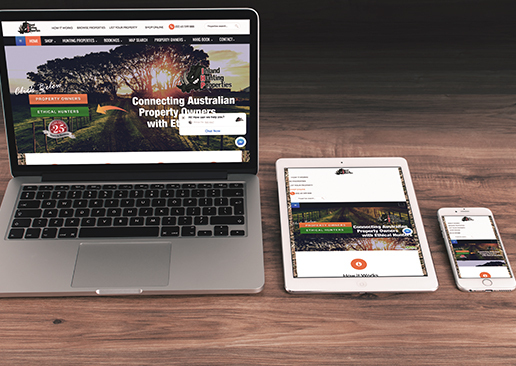 The site is hosted on fast servers in Sydney, Australia, is found first in it’s industry on Google, is mobile friendly, content and video rich and a testament to the enthusiastic and coachable attitude of the owner and her whole team. We are all proud to claim that Inland Hunting Properties is the leading hunter booking system of its kind in the world and has outsmart all of it’s competition in Australia through a focus on innovation and adaptability. The system is unique in that it facilitates the connection of Australian Property Owners and Licenced Hunters to tackle the serious issue of native animals being endangered by introduced feral pests. Inland Hunting Properties allow Australian farmers and property owners to earn money from paying hunters looking to connect with the land. So with essentially two categories of customers, this site and all it’s supporting products and links required making the complicated simple for all. With the help of business coaching, a blog, starter shop function, YouTube Channel creation and various e-books were also developed in conjunction with this client and her go-getting team – all adding to the bottom line improvements to the business and customer experience. Their vision for the future of the business is set with a clear strategy and the tools and knowledge needed to sustain, and importantly, continually improve their service, confidence, message and profits. LOOKING FOR A CUSTOM REAL ESTATE SOLUTION? If you are in real estate and require a property listing system that compliments your business and allows for your team to edit, update and list properties – contact us to see if we’re a good match and discuss how we can make the complicated simple for you too. I have been working with Ben and Sam for about 3 years now with business coaching. My business flows much more fluently and the growth in which 3 years has produced has blown me away on seeing my 5 year figures. The growth can only be attributed to the changes we have implemented. Ben and Sam haven‘t just advised me what to do, but also rolled up their sleeves and helped us integrate systems and new ways of doing things. I recommend anyone who is genuine in wanting growth for their business to see this pair. But be genuine in your decision, you have to complete the work they set for you to see your profits skyrocket. Your Mini CFO is one of those business to business organisations that just gets it. Amanda is proactive, always listening to suggestions, and implementing what is proven to work. Without a web presence, this new business required a website built fast and on a startup budget that adequately reflected the service she offers to her customers and her future vision. 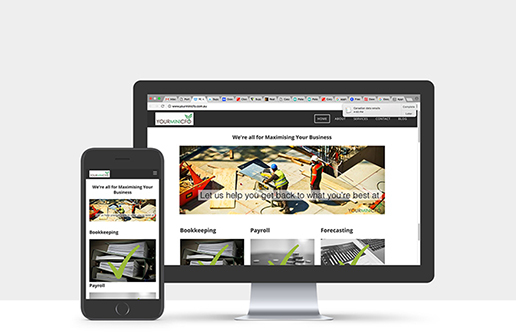 With an easy to use, intuitive layout, the Your Mini CFO website enables the user to quickly browse important information and services then prompts the user to either pick up the phone and call or send a message through the various contact pages. The site is simple but features the preferred keywords her potential clients are searching for to find her services as well as search friendly video. The client was determined to take her startup business to success quickly and achieved that by combining a few key Ben & Sam business smart solutions. She committed to producing blogs to keep her online content rich, keep her clients informed through email marketing and effectively sought (and continues to gain) new clients regularly by face to face networking in her local Port Macquarie and surrounds. Ben & Sam Business Coaching and Consulting keeps Your Mini CFO accountable to their goals in both life and business and aids in their ability to adapt to new developments, navigate challenging circumstances, and stay focused on the achievement of a blend of success they can be truly proud of. If you’re a startup business owner or team making the transition from job life to ‘your own boss’ life and need guidance, support and tried and tested strategies along the way, get in touch and let’s chat about how together we can make that happen. for getting things done and having support along the way.